Xiuqiang Xie is the fourth PhD student from the Centre for Clean Energy Technology to receive a China Scholarship Council award. Xiuqiang Xie, a PhD candidate from the Centre for Clean Energy Technology, has won a 2015 Chinese Government Award for Outstanding Self-Financed Students Abroad. 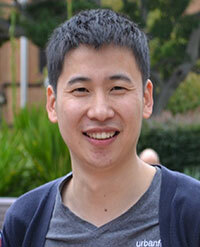 Xiuqiang was 1 of 15 international PhD students in Sydney to win the Award, and will receive $6000 USD from the Chinese Government to continue his research at UTS. The award continues a track record of outstanding success for Chinese students studying with the Centre. To date four students have received awards under the scheme including Dr. Hao Liu (2009), Dr. Bing Sun (2012), Dr. Dawei Su (2012) and now Xiuqiang Xie (2015). “This prestigious award from China Scholarship Council is an encouragement for me to go further in my career,” Xiuqiang said. Xiuqiang completed his Bachelor of Science (Applied Chemistry) at Qingdao University in China in 2009 and went on to complete a Master of Science (Physical Chemistry) at Fuzhou University in 2012. He then worked as a Research Assistant at the Fujian Institute of Research on the Structure of Matter at the Chinese Academy of Sciences. After receiving a UTS International Research Scholarship (IRS) and an AutoCRC (Excellerate Australia) Doctor of Philosophy Scholarship, Xiuqiang left China to commence his PhD at UTS in 2013. “I was attracted by the cutting-edge research fields at UTS Science, as well as the good reputation of Professor Guoxiu Wang’s group,” Xiuqiang said. Xiuqiang’s research topic, ‘Molecular Modification of Carbon Materials and the Applications for Lithium Ion Batteries,’ aims to contribute to a decarbonised energy future. “My research topic is focused on rechargeable lithium/sodium-ion batteries, which are green technologies for energy storage and conversion,” Xiuqiang said. Xiuqiang is currently a visiting PhD student at Drexel University in Philadelphia, where he is continuing his research under the supervision of Professor Yury Gogotsi. Xiuqiang, who has already published 8 papers as first author during his time at the Centre for Clean Energy Technology, plans to receive further training as a postdoctoral researcher once he has completed his PhD. “In this way, I hope to be better prepared to offer my solutions to the challenges in my research area,” he said. Xiuqiang would like to thank Professor Guoxiu Wang, his supervisor at the Centre for Clean Energy Technology, whose support he believes made his international study possible. “My success in winning this award is closely related to the help from our group team at the Centre for Clean Energy Technology” he said.